In both Political Science and the Humanities, the old boys network which prevented progress is collapsing, though it is hard for those who have lived in a field without progress to describe this. Indeed, some senior IR scholars now rail against the fieldâ€™s grand theories. In his 2010 ISA presidential address, for example, David Lake described the â€œismsâ€ as â€œsectsâ€ and â€œpathologiesâ€ that divert attention away from â€œstudying things that matterâ€ (Lake 2011: 471). Thus, it is not surprising that â€œthe percentage of non- paradigmatic research has steadily increased from 30% in 1980 to 50% in 2006â€ (Maliniak et al 2011: 439). Of course, one could advocate for middle range theories while disparaging grand theories, and indeed Lake does just that. The field is not moving in that direction, however. Nor is it paying more attention to formal or mathematically oriented theories (Bennett et al 2003: 373-74). Instead, it is paying less attention to theories of all kinds and moving toward simplistic hypothesis testing. Those doing digital humanities tend to agonize over how we define the field (or is it a methodology?). Matt Goldâ€™s edited volume Debates in Digital Humanities nicely sums up many of the ways people have tried to define digital humanities and what we mean when we say we do digital humanities. Certainly there are some common characteristics within the broad range of approaches, but the work itself is broad: itâ€™s interpretation, coding, building, archives, theorizing. Why define digital humanities? The enterprise is somewhat pointless. The promise and excitement of digital humanities lies with what we can do with it, not how itâ€™s defined. But the queston is inescapable. I don’t believe that the new International Relations work is apardigmatic, or that Digital Humanities is undefined. Rather, like other useful areas, these fields are defined by their tools and methods, not by ancient theoretical battles that can never be won. Chemistry is not the science of phlogiston, it is the science of titration and fission. Likewise, International Relations and Digital Humanities are increasingly defined by the tools they use to make progress, not connections in an old boys network. This is a good change. 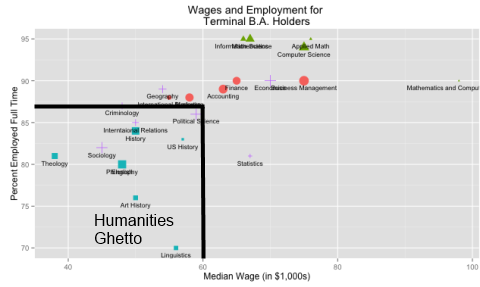 Yesterday I mentioned the ghetto of the humanities, those fields whose graduates (a) can’t do math, (b) can’t conduct useful research, (c) can’t stay employed, and (d) can’t get paid. The adoption of useful tools and progressive science is the best way to turn this around. The emerging paradigms of International Relation are embedded within statistics and modeling. The emerging definitions of Digital Humanities are embedded within text mining, semantic networks, and big data. What do these have in common? Useful tools designed to provide answers and enable progress.